A new, high-end British soft drink is looking to bring a more theatrical experience to alcohol-free offerings – without creating more work for bartenders. “The craft of making bespoke coffee, decanting with elaborate wine tasting, or the artistry involved in cocktail making are hugely satisfying for guests,” said Kolibri’s co-founder, Kamila Sitwell (above). ‘Until now soft drinks offered no such experiences. Mass-produced and standardised approach to food and drinks must change because people expect their unique preferences recognised and catered to, especially in the hospitality sector. “Sugar, like any ingredient, is only a problem when it’s over-engineered in recipes,” Sitwell commented. “Kolibri drinks empower each customer, giving him or her choices and control of sugar and calories. The drink clocks in around 40kcal per bottle with all the syrup added, and is available in three flavours: Strawberry & Basil, Cardamom & Chilli and Elderflower & Lime. The brand expects each bottle to sell for £6-7 on fancy restaurant/bar menus. 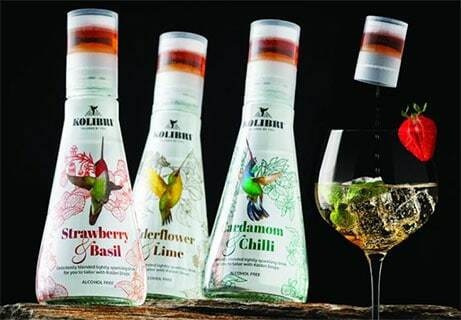 UK glass packaging manufacturer, Beatson Clark, has developed a new bottle for Kolibri Drinks. Kolibri’s Sitwell said: “At a time when consumers are incredibly discerning and expect premium experiences in all aspects of branding, standard off-the-shelf bottles wouldn’t work for Kolibri Drinks. I spent many years investigating trends and insights for many leading soft drinks brands. Sugar has been a massive challenge, not just in the UK but globally and across many food and drinks categories. However, all the industry solutions seemed painfully inadequate to me– penalising sugar tax, smaller bottles, controversial sweeteners, niche and often weird-tasting alternatives. I had a ‘eureka’ moment when out dining with friends. We ordered the same drink – homemade lemonade. It should have been an easy order, except it wasn’t! I came back from the holiday and dived straight into data, analysis and research, but found no evidence of bespoke bottled drinks anywhere. I spoke to every leading insight agency in the UK, no one heard about customisable softs. I approached a couple of colleagues I admired greatly in the beverage sector, they thought the idea was great but impossible to execute. There are so many hurdles and challenges to overcome that without all 4Ps, any entrepreneur will struggle. One more thing worth mentioning is self-education. There is no need to re-invent the wheel, every business challenge has been analysed and then written about in detail and from every angle. I read voraciously, 100+ books a year. All business subjects from strategic planning, finance and funding, selling strategies, pitching, social media hacks, inspiring biographies and brand stories as well as books on mindset and motivation. Alcohol will continue to decline and the quality of all drinks will be scrutinised. Those who increasingly abstain, and there will be more of them, will require healthier yet more adventurous alcohol-free drinks. The likes of Seedlip – alcohol-free spirits, will continue to excite trade and consumers with new alcohol-free possibilities. Water is currently the winning category but in the war on unnecessary packaging and consumers becoming more ethical, bottled waters – healthy but delivering zero experience – are being increasingly replaced with jugs of garnished tap water. This will hurt operators bottom line while consumers will feel ‘cheated’ on the overall dining experience. No one wants to go out and sip tap water in establishments which should delight with gourmet experiences across all food and drink categories. I’m a believer in the power and importance of big dreams. Big aspirations that take hold of you and your life and won’t let go. In 10 years’ time I see an exciting product range, well-established category of bespoke drinks and international presence. Bespoke will be the future. It just makes sense.